A man begs for money from a patron leaving one of Midtown’s critically acclaimed restaurants, where a roasted mushroom salad is $14. 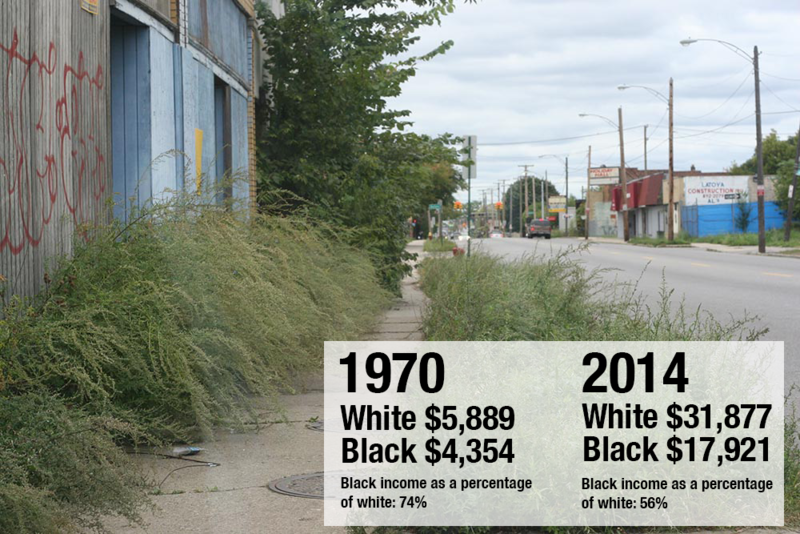 But the city’s black community is now one of the nation’s poorest, with much of the blame placed on decades of job loss, especially in auto and government jobs, and the migration of middle-class white and African Americans to the suburbs, where jobs are more plentiful. 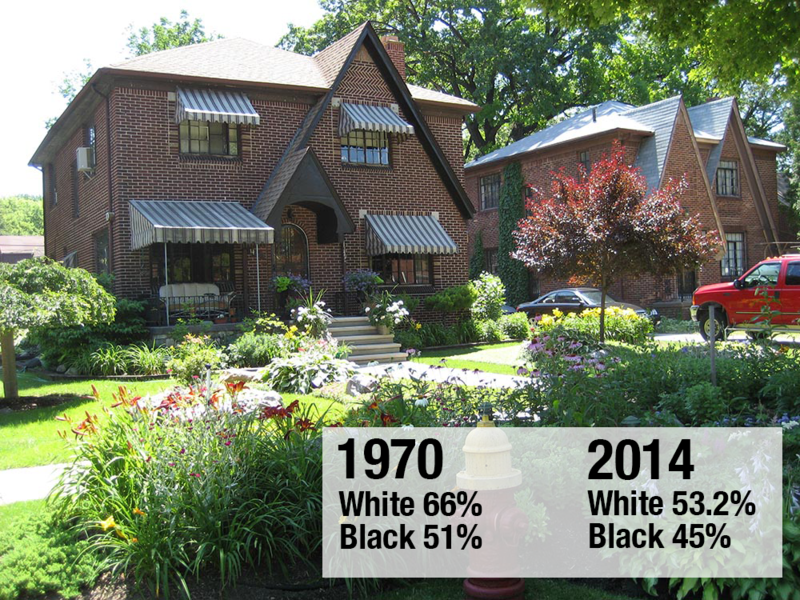 Below, some jarring numbers showing how far black Detroiters have economically regressed since the troubles of 1967. Homes in the more upscale Rosedale Park-Grandmont neighborhood on the city’s west side. Detroit's loss of prosperity is reflected in the abandonment of its once-busy thoroughfares. Above: E. 7 Mile. Man sleeping on sidewalk in the mid-1960s. 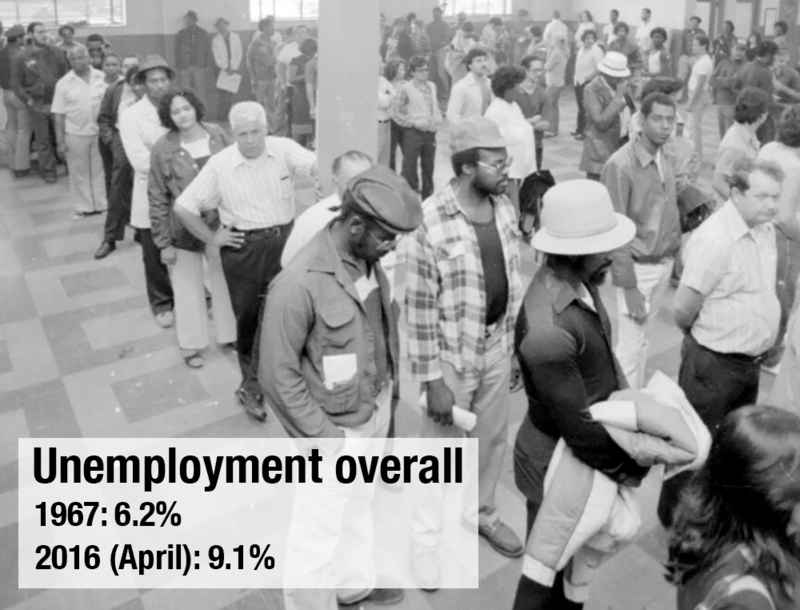 Aggressive government action to help the poor faded over the decades, and Detroit continued to lose jobs at a steady rate. 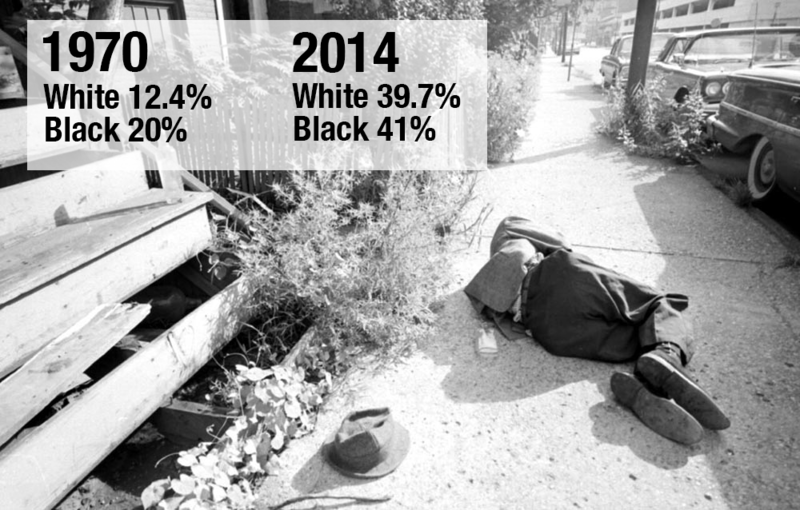 For many years, Detroit has been one of the nation’s poorest big cities. By 2016, the city had received international attention for its large number of home foreclosures and water shutoffs, and a study this year published in The Journal of the American Medical Association showed life expectancies for Detroiters – 77.7 years — ranked among the shortest for residents of U.S. cities. Long lines for unemployment checks in Detroit in the 1980s. Sources: U.S. Bureau of Labor Statistics; U.S. Census; “Violence in the Model City,” by Sidney Fine; “Divided Detroit,” Reynolds Farley, Sheldon Danziger and Harry J. Holzer; New York Times; Detroit Free Press. These were the words of a three-year-old Dana whose father had just been detained to be deported. The mother, Mireya, says the little girl cried every night, saying she wanted her father home and was confused as to why he was in there in the first place, demanding that he is brought home to her. The mother says on one visit to the detention facility, the daughter asked her to break the glass, unbeknown to the child that she would probably never see her father free any time soon. I watched an old black man cry today. Sitting at a picnic table in Chandler Park, by census estimates the poorest area of the city of Detroit, John Henry Irelang talked about poverty in his neighborhood. But, empathy for his neighbors was not the only reason he cried. He cried because of lost opportunity. Bill McGraw reports for Bridge, a Michigan Radio partner in the Detroit Journalism Cooperative. The Black Lives Matter movement was peaking a year ago, when protesters took to the streets of Baltimore over the death of a black man in police custody. On the same day, an angry crowd gathered on Evergreen Road on Detroit’s west side. The situation on Evergreen quickly grew tense. An agent from U.S. Immigration and Customs Enforcement who was on a task force with Detroit police had shot and killed a 20-­year-old black Detroiter, Terrance Kellom, a parole absconder who was wanted for armed robbery. Craig’s style is low­-key and controlled, more Woodward Avenue than Sunset Strip, but he doesn’t mind the nickname. He says his visibility is part of a deliberate strategy to communicate with Detroiters.